On May 24, 1944 at 0655 hours eighteen aircraft of the 100th “A" Group and seventeen of the “B” Group set out for Big “B” – Berlin. Nine crews would not return. The following is the story of that mission from Group Narrative [Official 100th BG Post-Mission Report], formation charts, and through the eyes of Frank Malooly, Maurice Fitzgerald, Anthony Lombardi, Fred Cebalo, Edwin Stearn, Jim Brown, and CENTURY BOMBERS. Most of us have heard the phrase “the fog of war”, but few, save those who have served in combat, can truly understand the full scope of the statement. So much happens so quickly, and what seems perfectly logical and, perhaps, maddening from one perspective, is totally different from another. This mission is a good illustration of that. Many of these men have since passed away, but their written memories bring this mission alive for us. Following this account are two more individual narratives by Neil Jespersen and Robert Black. There have been many debates over the years by scholars and historians about the USAAF policy of assigning stateside Training Command officers into combat theater positions of leadership without proper "hands on" experience. In some cases it made no difference while in others, it could be dangerous. On May 24, 1944 the "fog of war" would prove disastrous for the Bloody Hundredth. It began normally. The “B” Group, leading the Combat Wing, would take off first with Col. Ollen Turner in command flying with Captain Jack Swartout. The General Narrative report tells us that seventeen aircraft including one P.F.F. departed the base at 0640-0654 hours. By 0750 hours the group had assembled over Splasher #6 at 12,000 feet. 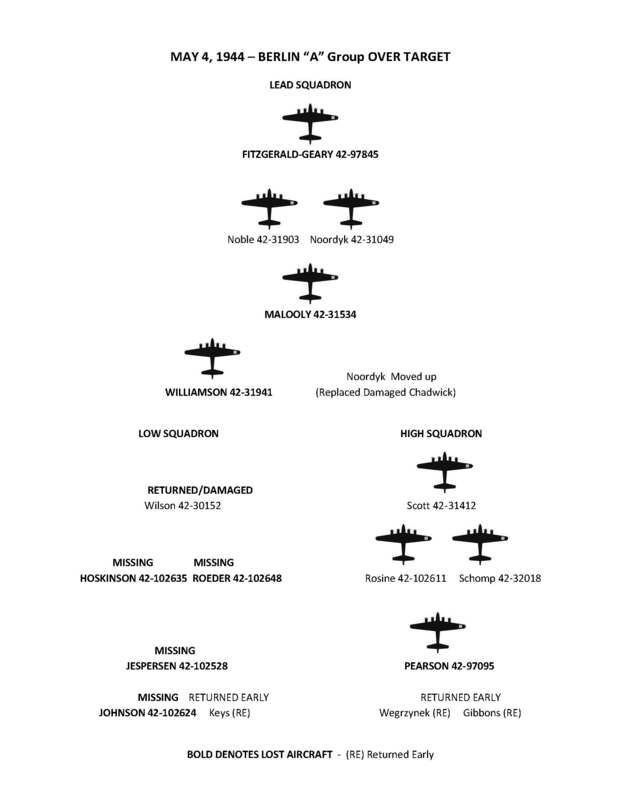 The eighteen aircraft of the “A” Group departed the base at 0655-0724 hours. By 0800 hours the group had formed over Splasher #6 at 10,000 feet. The 100th “A” Group flew as low group in the 13th “B” Combat Wing. Thus the 13th “B” Wing had 100th Groups as its bookends. Anthony Lombardi, TG on Roeder’s ship, saw something whiz by his position and asked what it was. “Soon McElroy [BTG] called on the intercom to say the door fell off the ball turret, and he had narrowly escaped falling out sans parachute. After the loss of its wing, the aircraft broke apart somewhere between the radio room and the tail. Radio Operator Frank Goldstein fell from the aircraft without his chute. Nathan McElroy, whose chute was lost when the ball turret door fell off, was able to grab the chute from the radio area, put it on, and bail out safely. Fortress 42-102635, piloted by Martin Hoskinson and co-piloted by Marvin Apking, who with their crew were on ‘their first or second mission’, was from the 349th Squadron. All ten men were killed. The Clarke Johnson crew flying A/C 42-102624, were on their first mission. Seven of the ten men aboard were killed. Jespersen’s crew, flying 42-102528, bailed out with their ship on fire. Pilot Neil Jespersen and Co-Pilot Robert Atkins were taken prisoner, together with engineer George Kostoulakos, waist gunner John Legg and bombardier Joseph Savino. The rest of the crew was KIA. CENTURY BOMBERS explains that the B Group lead plane with Fitzgerald and Geary was hit “by a shower of lead”, which knocked out part of the interphone system and damaged the oxygen lines. With manual controls gone, Geary put the ship on A.F.C.E. [Automatic Flight Control Equipment]. Delbert Pearson’s crew, from the High Squadron, was also knocked out by fighters and disappeared into the clouds. Nine of the men aboard bailed out safely and became POWs. The tenth man, replacement ball turret gunner James Morrow, from the Tashjian crew, was killed. The lone loss from the “B” group leading the wing was NELSON KING, A/C 42-31306, piloted by Emil Stiewert, who was killed with bombardier Irving Jacobwitz and tail gunner Frank Kroczynski. The rest of the crew, who were on their eleventh mission, became POWs. Debriefing that night at Thorpe Abbotts was a gloomy affair. Nine crews had failed to return. Of these nine crews, 34 men were KIA, with the remaining 56 becoming POWs. On May 24, 1944, my flying career with the USAAF came to an end. Not intentionally so, but I would never have another assignment which would be primarily flying. I felt a great sense of relief when my feet touched earth again – relief that a person feels when a long dreaded calamity has finally fallen, but greater than that was the near over-whelming feeling of thankfulness that I was still alive. It was finished, but I would remember all my life the piercing emotional experiences of those four months of combat. I would remember the beauty of sky and cloud – the eerie dream-like sensation of being suspended in space when haze and layers of clouds shut out earth and sky, and the feeling of sitting on top of the world when skies were clear and the patch-work colors of the earth spread out beneath for hundreds of miles; the splendor and warmth of the sun after climbing up thousands of feet through an overcast; the majesty and symmetry of hundreds of bombers in formation; the exhilarating, lightening sensation of the ship at bomb-away, and the turn away from the target toward home; the nerve shattering strain of flying through heavy flak and fighter attacks; of seeing other planes hopelessly crippled dropping out of formation with parachutes blossoming in their wake; and on the ground between missions, the every present longing for home and loved ones, and the dread of the next mission coming up. I came down near Ratzburg in Northern Germany. I was free for three or four hours before I was picked up. It was a cold drizzly day, and I sought refuge from a freshening downpour under a railroad culvert. Five men of the home guard who were searching for me chose the same shelter. On the way into town under guard, I saw small pieces of my airplane scattered about in fields where they had come to rest. Later, the cumulative effect of all the terrible events of the past few hours upon my nervous system hit me like an avalanche, and I paced the floor of my cell through the night, my mind a seething caldron through which the violence and terror of that morning moved relentlessly in jumbled but endless procession. The next day we were taken by train to Hamburg. I had seen the results of the German raids on London, but the utter devastation of Hamburg staggered the imagination. I hadn’t realized how completely a great city could be destroyed from the air. After a series of raids a few months earlier, only twenty percent of the city was left standing. The depot was a shambles. As we stepped off the train, the people recognized us by our clothing as enemy airmen and an ugly crowd began to gather. I have never seen such hatred and bitterness as those people plainly felt towards us. Spitting at us and shouting hysterically, they closed in and I’m sure would have lynched us there in the station if the guards had not turned their backs on us and pointed their guns at the crowd, ordering them back. We sent the night in jail somewhere in the city. My cell had a bare raised platform for a bed – no blankets. The turmoil in my mind had subsided somewhat, but still I found it impossible to relax to the point of sleep. We arrived at the Luftwaffe Interrogation Center at Frankfurt the following afternoon. We were taken off the train in the suburbs and took a street care out to the prison camp. It was a beautiful spring day, and there were children playing on the quiet street as we waited for the streetcar. For a little while the war seemed far away. After a few days of what seemed like pointless questioning, my co-pilot, bombardier and I were put on a train with a group being transported to a permanent officers camp. This would take us all the way across Germany into what is now Poland to Stalag Luft III near Sagan. Sagan was situated on a flat plain with no mountains visible in any direction. The camp was surrounded by a pine forest which had been planted in even rows, and it was divided into three compounds – two occupied by American officers and the third by Royal Air Force personnel. The Germans left administration within the camp up to the POWs themselves. Each compound operated as a military until with the senior officer prisoner in command. The morale was high in camp that summer. The Allies had landed in Normandy just two days after my contingent arrived in Sagan, and a clandestine radio in camp brought glowing BBC reports of rapid advances. The general consensus was that we would be home by fall. In the meantime, there was much to do to keep busy. Our barracks were divided into rooms, and eight men were quartered in each room at first. Later it would be twelve and finally fourteen. Aside from the menial tasks of care and maintenance dictated by our womanless society, I read a lot (the compound had a rather modest library furnished by the YMCA), tended a small garden, built scenery for the compound theatre, and made cooking pans and plates from tin cans for the fellows in my room and in between times managed to get a beautiful suntan that I fully expected to show off in Tucson in the fall. But the war dragged on and on as the doggedly advancing Allied armies were slowed almost to a standstill. The beautiful weather we had known through the summer faded into cold gray days as winter approached. The only bright spot on the horizon was the prospect of receiving mail from home. Then in early December it came, my first letter from my wife Florence. It had been written in July, but as least she knew I had survived the shooting down of my plane. The increasing tempo of Allied aerial activity through the summer and into the fall had unpleasant side effects for the men in the prison camps. As Allied fighter planes gained control of the air over Europe, anything that moved on the highways or railroads became fair game and the German transport system began to fall apart. Being very non-essential to the war effort, the shipment of Red Cross food parcels to the prison camps stopped. At Sagan, we were fortunate to have a full warehouse, but even so it was deemed necessary to go on half rations in the fall. Slender waist lines became the style, and food replaced women as the chief topic of conversation. The thing I remember best about those winter months in Sagan was being cold and hungry all the time. We were not prepared either mentally or physically for a winter in Germany, and an aura of gloom and frustration hung over the camp. Letters and packages from home cheered us, but even more important was the knowledge each of us had that ultimately our side would win and we would return home again. I spent many happy hours oblivious to my surroundings, carefully going over and over each loving detail of my home-coming as I dreamed it would be. About once each month, we had classical record concerts in the theatre. We had to take blankets to wrap up in to try to keep warm because the building was unheated, but the stirring music of those great artists brought warmth and comfort to the soul. I had only one package from Florence, but she enclosed some pictures of herself, and it made life a little more bearable to have her smiling down at me from the wall above my bunk. In January there was a sharp increase in German aerial activity around Sagan. Many types of aircraft – some we had never seen before – flew over. The low overcast forced them to fly just above the tree tops and they seemed to use the camp as a navigation point. Obviously something was brewing to the east. By mid-January, we had begun to hear the low rumble of artillery when the wind was from the east. The guards told us the Russians were less than fifty miles away. All the camp strategists and tacticians agreed that it would be impractical for the Germans to move us. How could they guard and feed so many prisoners outside of the barbed wire? Besides, and this was the clincher, we were such an emaciated group now (I was down to 135 pounds) we just weren’t physically able to walk very far and the railroads were so balled up they wouldn’t be able to move us by rail. But the Germans were from another school, and one night about nine o’clock, they came in and told us to be ready to walk out in an hour. Suddenly we realized that there had been a large measure of security in the closely regimented, cold, hungry, frustrated lives we had led at Stalag Luft III. All the stories we had ever heard of German brutality, and they were legion, came to mind. Besides that, it was bitterly cold and snowing, but since we had no choice in the matter, we got ready to go. Packing wasn’t difficult. I merely took my other pair of trousers, tied a knot at the bottom of the legs, stuffed my two German and one GI blanket down one leg, my other shirt and long johns, socks, handkerchiefs and town down the other – topped it off with my share of our larder and a few personal items – tied it at the top and I was ready to go. We formed up about midnight and moved out through the front gate. The temperature was hovering around zero and there was a heavy snow falling. The guards set a brisk pace as though the Russians were baying at our heels, but after the first hour the pace slackened. We walked steadily for eight hours with ten minute rest periods each hour. With ten thousand prisoners on the road the line of march stretched for miles. When we stopped to rest the next morning at a Russian labor camp, the snow had abated somewhat but the temperature seemed even colder. Since there weren’t buildings enough to house all of us, we had to take turns inside, but there was so little room, each man could only stay two hours. When I took my turn, I found it so crowded there wasn’t even room to stretch out on the floor. Outside we sought shelter from the bitter wind on the leeward side of the buildings, but we had to keep shuffling about on the frozen ground to keep our feet from freezing. About four o’clock word came down to form up again on the road. I will never forget the second night on the road. When we started our march that evening, most of us hadn’t slept for thirty-six hours. Just after dark during a rest period, one of the guards opened fire – at what, we didn’t know. There was a mad scramble for the ditches alongside the road, and luckily only one man was hit and him not seriously. I remember plodding mile after weary mile through dark canyons formed by the tall pines on either side of the narrow ribbon of road. Now and then the trees swept far back from the road revealing vast areas of white where snow-covered fields lay. All of the houses were dark in the small villages we passed through and only the dogs seemed aware of our passing. The one exception was an old couple who stood out beside the road after midnight in one of the villages ladling out hot water to the men as they passed. I hadn’t realized just plain hot water could taste so good. It was a warm thoughtful gesture, and I deeply appreciated it. Long before midnight, both prisoners and guards had begun to drop out. Most of the guards were older men and some of them were the first to go. Mind numbing weariness dissolved the barriers between us to a point of indifference, and it didn’t seem odd or unusual to see a prisoner helpfully carrying a rifle for a faltering guard. We stopped having rest periods after midnight because so many men were unable to get up and go on again each time. Even so, by morning fully a third of the group had dropped out. The Germans collected these men into groups and left them with guards in barns or whatever shelter was available along the way. We reached the point of complete and utter exhaustion and kept on going. Somewhere up ahead there was an awakening from this awful nightmare of cold and misery. Along toward morning I began to go to sleep on my feet as we plodded along, and time after time I was jolted awake as I fell full length in the snow. We reached our destination shortly after dawn and it was a dream come true. My group was sheltered in a pottery factory and it was warm and wonderful. Even the floors were warm. We unrolled our blankets and prepared to sleep for a week. We had walked fifty-four miles since leaving Sagan and I hadn’t slept for over forty-eight hours. We spent two days and nights recuperating before we moved on. As we moved on, clearing skies and a rising temperature seemed a good omen for what lay ahead. That night I was introduced to a German barn for the first time. Actually it was quite comfortable sleeping on the loose hay. Later on we would spend night after night sleeping in barns while we moved from Nuremberg to Moosburg. We spent one more night on the road, sleeping on the floor of a large gymnasium. I remember it well because the Germans had set up a field kitchen and served us the most delicious barley soup I have ever eaten. The next morning we were loaded into French forty and eight railroad freight cars. They were much smaller than American freight cars and had probably served as troop carriers in France during World War I, for each was placarded on the outside in French, ‘forty men or eight horses’. There were fifty-two men in the car I was in and I sat for two days and nights with my knees up under my chin because there wasn’t room to stretch my legs out. The weather was cold and stormy again, for which we were thankful because there would be less likelihood of the train being strafed by our fighters. We were nearly bombed in Breslau, pulling away from the city just as the RAF started a heavy night raid. The section of the camp we moved into at Nuremberg had been occupied by Italian officers and they left it literally crawling with fleas. With flea bites to add to our chilblains, we kept pretty busy scratching, and scratch was about all we could do because we didn’t have any insecticide. Sharing a bed with a bunch of ravenous fleas was a little bit unnerving, but it at least diverted some of our attention away from our number one problem – food! The German food ration was just enough to whet our appetites, consisting of one cup of dehydrated soup and a couple of slices of bread each day. This was supplemented with an occasional issue of cheese, margarine and blood sausage. Red Cross parcels had been the mainstay of our diet at Sagan, and there weren’t any at Nuremberg. While we were at Nuremberg, the city suffered continual air attacks. Fast twin-engine RAF mosquito bombers came over each night singly and in small groups on harassing raids, as they did to every major city in Germany. We were rather complacent about these nightly raids until one night a mosquito pilot dropped his load of bombs through overcast and it landed right on the camp perimeter. None of the prisoners were injured, but our faith in the RAF suffered. The German propagandists called the airmen who manned the bombers ‘terror flyers’ and I was able to understand why after being on the other end of a few raids. The arrival of the bombers was always heralded by the air raid sirens, and there was a note of terror in just their eerie wail. Toward the end of February, the RAF mounted two consecutive heavy night raids against Nuremberg, and it was a terrible thing to see and hear. It was a violet thundering panorama of light and sound. The long probing fingers of the searchlights anxiously swept a sky overspread with the smoke and angry red puffs of anti-aircraft shells. Brilliant parachute flares lit the target area as they slowly drifted down, and the earth shook as bombs fell into the city. The attackers always paid a price, and we saw several bombers, hit by night-fighters or flak, burst into flame and plunge toward earth. A few days later, the Eighth Air Force came over in heavy daylight raids, but more airplanes were involved, and there was a continuous stream of bombers over the city for what seemed like hours. It was a thrill to see our bombers in action again, but it was very sobering to realize that just a few miles away people were dying by the hundreds as wave after wave of bombers dumped their bombs. Prison camp life reached its lowest point at Nuremberg. The camp was filthy and the fleas made life almost unbearable, but even worse was the added misery of being cold and hungry all the time. The Germans never issued fuel to heat the barracks – this was a luxury we could do without. Before we left Sagan, my weight was down to 135 pounds, and while we were at Nuremberg, I must have lost at least another ten pounds. Then one day when the morale in camp had reached absolute rock bottom, three white six by six GMC trucks with big red crosses on their sides rolled into camp. Only a liberating army could have been welcomed with more enthusiasm. Because of the critical food situation with the POWs in Germany, the American Government had given fifty of these trucks to the International Red Cross to shuttle food into the prison camps. It was good to know our government hadn’t forgotten us. Clearing skies and warmer weather brought a sharp increase in the tempo of the war. The winter stalemate was broken and the Allied armies were on the move again. Since we were in the western part of Germany, we expected to be moved again, and we weren’t disappointed. This time we were headed southeast toward Munich. Our departure from Nuremberg was as calm and unhurried as the departure from Sagan had been chaotic. Although we had finally won the battle of the fleas with the help of some insecticide the white trucks brought us, we were not reluctant to leave the dirty crowded conditions and generally unpleasant memories of Nuremberg behind. Allied aircraft had become a familiar sight over Nuremberg. We knew the pilots were briefed on the location of the prison camps, but it would be hard to establish the identity of a long column of men from the cockpit of an airplane several thousand feet away. Therefore, it was decided that we should travel at night and sleep during the day. However, it took only one night to prove the impracticability of this plan. Allied control of the air forced the Germans to move all their troops and supplies at night, and there just wasn’t room for all of us on the roads. In the forenoon of our second day on the road, we had a tense few minutes when two P-51’s came over at medium altitude. We watched them warily as they lazily criss-crossed our line of march. Half an hour later they were still loafing around in our general area, and we began to realize that they recognized the straggly rag-tag column of men as American POWs. It gave us a warm feelings to look up and see them flying top cover for us. It did until they had been up there for about two hours and we had become so complacent about having them there we stopped watching them. Then they livened the party up. All of a sudden we noticed a change in the sound of their engines and found ourselves looking right up their gun barrels as they came screaming down on us. There was a frenzied scramble to get off the road. I rolled and slid down a twenty-five foot embankment, pack and all, and caught just a glimpse of them as they flashed by at tree-top level, waggling their wings. It was a nice friendly gesture, but as we picked ourselves up and counted our aches and bruises, we couldn’t fully appreciate it as such. Each day thereafter until we reached Moosburg, two P-51’s would look us over at least once during the day, and we knew that the USAAF was watching over us. Nevertheless, we carried a bundle of white cloth panels with us and a team quickly spread them on the ground to form a large USAAF insignia and the letters POW whenever Allied fighter planes appeared in the area. By this time it was quite obvious that the war would be over in a matter of weeks. Most of the civilians we encountered had already accepted defeat, but the German Army was retreating stubbornly, blindly destroying their own roads and communications as they withdrew. At this point, about all that was needed to escape was the desire, but there were few takers. As a matter of fact, the pendulum had swung so far the other way, we worried about the guards deserting us. The white Red Cross trucks were making regular deliveries to us even though we were on the road, and the guards were issued food parcels along with the prisoners as an incentive to stay with us. We were able to barter the cigarettes in our food parcels for potatoes and bread in the little towns we passed through. Food was still a problem, but we were gaining weight and on the whole, morale was pretty high. We dragged our feet and stalled along the way as much as the German Commandant would permit, in the hope that an American armored spear-head would overtake us before we reached the Danube. Our strategy failed, though, and there wasn’t an Allied combat unit within a hundred miles when we crossed over. The Danube was disappointing. I expected much more from a river with such a romantic background, but anyhow it was blue. The next day we straggled into Stalag XIIID at Moosburg. Our group was the last to arrive. Living conditions were about on a par with those at Nuremberg – crowded and dirty, but we didn’t mind because we knew the war couldn’t last much longer and we were eating – not much, but regularly. We were told this was to be a temporary stop to rest for a few days and get into shape to move on. A week later, BBC news broadcasts had Patton’s Third Army armored columns only seventy-five miles away. The next day was Sunday, April 29, and one of the really big days of my life. That morning we saw tanks on the crest of a hill about a mile from camp. They were too far away to identify and we thought they must be German since our armor had been reported so far away just the day before, but as we watched, a liaison aircraft with American markings crossed over the hill and a tidal wave of excitement swept through the camp. There was a sharp exchange of fire around the camp which quickly faded away as the tide of battle swept by us. We climbed up on the roofs of the buildings and from that vantage point we could see the smoke and fire of fighting in Moosburg. As the fighting died away – so far away we could barely make it out, we saw the Stars and Stripes rise fluttering to the top of the flagpole in the town square and the camp went wild. It was a cherished moment I will never forget. Bob Wolff revisits the final mission of Wolff Pack. On September 16, 2000, Bob Wolff wrote a letter to his six surviving crewmates. He began the letter by telling his friends to note the date and think back 57 years! No doubt the men didn’t have trouble visualizing the date and happenings from so long ago. Bob and Barbara Wolff had decided to tour southern France. They found the country beautiful and the people very nice. After the tour, they hired a drive/interpreter and headed for La Rochelle to see if they could locate the stone prison that held Bob’s crew the night of 16 Sept 43, their first night of captivity. Bob could visualize his cell, but couldn’t recall the building or the surroundings too well, so he hoped to find some local people that might remember the location. Rob, the driver/interpreter had written ahead to several people in the area who had agreed to help Bob and Barbara with their search. One was Monsieur Jean Labadans, a hero of the resistance fighters. "He did a lot of damage to the Germans during their occupation of France in WWII and has many medals from his grateful country." Monsieur Labadans drove with the Wolff to the Mayor’s office, where the police had reserved a parking place for them. They found 15 or so people waiting for them there. Bob and Barbara were treated to a speech by the mayor, followed by the presentation of medals and a bottle of Napoleon cologne made in the area. The Mayor’s ceremony was followed by a short journey to a Veteran’s Hall where 30 or more people greeted the party. The room was decorated with paper garlands and American and French flags. Bob found himself being interviewed, photographed and giving endless handshakes. "I was flabbergasted! I was a celebrity to these people and I felt very honored. Many of these people had not been born at the time we ditched; yet they were interested in helping me to find the plane and the prison where we were held our first night as POW’s. I was humbled, honored, speechless, and amazed." The following morning they boarded a boat for a tour around the peninsula and Ile. d’Aix, a small island where Bob thought the prison might be located. "The entire forward portion of the tour boat was reserved for our party, which included a TV anchorwoman and cameraman! On the far side of the island the boat stopped and an announcement was made that this was where our plane rested. It was at Latitude 45 58.70N, Longitude 1 11.76 W. It’s actually marked on the local charts as being about 50 feet down at high tide. The announcement included the story of our final flight and I found myself thinking back. The war that we were expecting to engulf the U.S. came in an unexpected way, Pearl Harbor. I didn’t want to be drafted, so I enlisted in the Army Air Corps. Thus began my journey to Thorpe Abbotts and the 100th Bomb Group. The day before our last mission, our plane had been flown by another crew who brought it back with quite a few holes in it. Repairs were being made all night, but were not complete by takeoff time, so we were two hours late in taking off. It was no big problem because we were "tail end Charlie"…the last and the lowest plane in the formation…so it was easy to fit into the group when we finally caught up to them. It was the most dangerous spot in the formation and was our eighth mission. On our way to the target, which was in Southern France, the group flew very low to avoid German radar which covered most of England. At one time, over Wales, I believe we were so low we had to go around a hill with a tall antenna on it. As we approached our target, near La Rochelle, we turned inland at about 17,000 feet to find the target was obscured by clouds. As the group turned to the secondary target, we were attacked by fighters and flak. Our plane lost the number three engine and after getting it feathered we started to catch up to the group with three engines. At that point, the number two engine got it and, as we found out later, we acquired large hole in the tail. With only two engines in operation, we could not maintain formation and were falling behind, so we dove toward the ground to get away from fighters and flak. However, six German ME-109 fighters came after us. We got two of them. I saw one go down, smoking, behind some trees, and, flying at an altitude of about 50 to 100 feet, we dodged a bridge and a church steeple. The town was Rochefort, I think, and then we were out over water and the fighters left. Three miles out to sea, I heard a ‘pop’ and then a ‘pop, pop.’ The right outboard engine had blown three cylinder heads and caught fire. We were pushing it too hard, I guess. There was no choice but to land in the water. It was a good landing, the water was smooth and we all got out and into the dinghies. The plane floated less than ten minutes, but we had a good chance to see the hole in the tail (which I hadn’t felt when it happened). Then it dove to the bottom. A French fishing boat picked us up in a short time, but a German patrol boat was right behind them, with a machine gun trained on us. The fishing boat was directed to a dock on a small island not too far away where the Germans surrounded us. We were now prisoners of war. The date was September 16, 1943. The German military, at that time, did not mistreat their prisoners, but we were not treated as heroes either. Our first night was in an old stone castle on the island. It was not too pleasant. We were in individual cells, about four by eight feet, a stone shelf with straw for a bed, a pit at one end for ‘relief’ and a covered hole in the heavy wood door thought which we received food, a gruel with black bread." Bob’s attention was brought back to the present as the announcer finished his story. He was astounded when the other people on the boat burst into applause. It was quite an experience. The Mayor of Aix came out in a Coast Guard boat, and followed the tour boat into shore. He greeted Bob and Barbara. The Mayor had been 13 at the time Bob’s plane ditched, and he had seen the aircraft go in. He has lived on the island most of his life and indicated that he knew of no prison cells on the island. The most likely spot of incarceration was the Citadel on Ile. D’Oleron. The next day we left for London. From London, the Wolffs took a train to Diss, where Ron Batley, the 100th BG Museum curator, picked them up. It was, in a way, the finishing of that last mission…returning home to Thorpe Abbotts. "We were last at Thorpe Abbotts in 1984, and at that time is was a pretty good museum. However since then, they have done a fantastic job of transforming the control tower from what was originally a neglected and shabby building in a field of weeds, to an interesting and historical site that does credit, not only to the 100th, but to those that rebuilt and maintain this site. It is one of the finest museums of its type in Britain. The Varian Center is big and comfortable with pictures, videos, gift shop and refreshments. The area is beautified with grass and trees, and is truly a fine reminder of a great organization. After several hours, we took our leave on the late afternoon train knowing the museum is in good hands. If you get the chance, go. You won’t regret it. Certain missions conducted by the Eighth Air Force during World War Two will always be remembered because of their place in history, results achieved, losses incurred. Thus, much has been written about the raids on Regensburg, Berlin, Schweinfurt, Munster, and the shuttle missions to Russia and Africa. 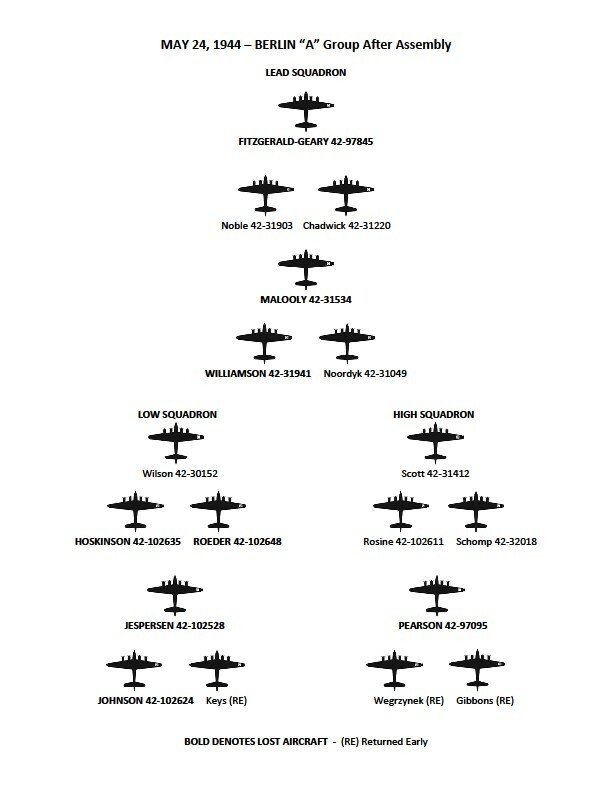 However, the very last missions flown by the 100th B.G. were also quite memorable. Not a single bomb was dropped on these missions which were dubbed "Chow Runs". The last mission in which I was involved was the city of Aussig. After that, there were simply no viable targets left to bomb---Patton's tanks were racing toward the Elbe River and the Russian forces were at the gates of Berlin. Days later we were surprised to observe that our planes were being modified in a strange way --- trap doors were being installed in the bomb bays. These doors were hinged on one side and attached to bomb release shackles on the other. We didn't understand the purpose of these changes; but, we did realize that, for us, the war was over. A few days later we gathered for a mission briefing. We were told that the Germans still controlled portions of the coast of Holland and that in preparation of their withdrawal, dikes had been blown resulting in extensive flooding of that low country. Because of that flooding, many of the Dutch people were stranded and, in certain areas, near starvation. The purpose of our mission was to fly in, very low, and drop food --- flour, beans, canned goods and other staples to the Dutch people. We were also told that Allied Supreme Headquarters was attempting to contact the German Headquarters to request safe passage into that air space. However, no answer was received. So, another message was sent stating that this was a mercy mission and requesting that the Germans not fire on these planes. We were understandably nervous as we flew over the coast and the German gun emplacements. We saw no anti-aircraft fire so Ike's message must have been received. The flight was quite exhilarating since we were at an altitude of 300 feet or less. It felt as if we were leap-frogging over higher islands of land and it seemed we were looking into the upper stories of the taller buildings. We dropped the food at the designated point and headed home. A day or so later we flew a second "Chow Run" mission. This time the Dutch people were expecting us and could be seen streaming in from all directions carrying bags and boxes or pulling small carts or wagons. The scene was so clearly visible to us at that low altitude. And also, clearly visible, was the message, spelled out on the ground, in flowers--- "Thank You Boys". I doubt there were many dry eyes as we dropped the food and headed back out over the Zuider Zee for home. The field of wheat, spread under a blue sky sprinkled densely with clouds, bobs and weaves in the ever-present English breeze, rippling like a farm pond. Quiet now, there is little evidence – save for a couple of buildings and some concrete slabs – of the brief period 60 years ago when this patch of earth roared with life. It was a time when flying machines lifted off from this field and flew into combat, returning – some of them, at lease – with men thankful to have survived another day. On a recent weekend, some of these men returned to the wheat field outside Thorpe Abbotts, England, about 20 miles south of Norwich and in the middle of nowhere. The veterans of the 100th Bomb Group looked across the growing crop and with their mind’s eye saw a time when they danced with death, a time when they risked everything. It was a time when they were young. "Young and stupid," said William "Buzz" Fitzroy. "You always thought ‘it wasn’t going to be me, it’s going to be someone else.’ That’s the thought you had." Fitzroy, 82, and living in Clinton, Mississippi, had not been on this piece of ground since July 29, 1944. That day, he left on his 35th mission as a pilot of a B-17. All he had to do was return safely and he could turn his back on the war. Thirty-five was the magic number. "That was my last one," he said. It was, too. But not the way he had hoped. His bomber was shot down and he spent the rest of the war in a German prisoner-of-war camp on the Baltic Sea. Camp life was bearable, but the first few hours of captivity were horrid. "The beat the hell out of me," he said. "The shot and hung five of my men." His parents were told he was dead and were presented with the Distinguished Flying Cross he was awarded. Several months passed before they heard the unbelievable news of their son’s survival. Walking up to the site of the old airfield for the first time since that day nearly 60 years ago, Fitzroy was asked how it felt to be back. He managed only, "It’s…"" before emotion prevented any more words from leaving his throat. Thorpe Abbotts was one of scores of airfields built around eastern England from 1942 and on through the war. From the bases, mostly carved from farm fields, the U.S. Army Air Force took the war to the enemy on the European continent. Most of the bases have disappeared, returned to farmland. At Thorpe Abbotts, only a control tower and one building remain from the base, along with some patches of concrete here and there. But local Englanders, not wanting to see this chapter of the area’s history die, created a museum in the tower and with the help of the 100th Bomb Group Association have created a memorial museum that tells the story of the crews and aircraft of the "Bloody 100th." Ron Batley, the museum curator, said the museum has a free 999-year lease from the landowner. About 20 veterans, most in their 80s, visited the museum in late June. Some had wives and children and grandchildren in tow, some had been there many times before. And some, like Fitzroy, were making their first post-war visit. "The guys I knew here were the most extraordinary people in the world," said Alvin Meiklejohn, 79, from Denver, Colorado. "It just has a mystical attraction. You can’t believe what went on here – the simply extraordinary things I saw people do." The 100th BG flew from Thorpe Abbotts from June 1943 until the end of the war in 1945. In those 22 months, the crews flew 306 missions and dropped more than 19,000 tons of bombs. The gunners were credited with downing 261 enemy aircraft. Additionally, 1,010 were "probably" destroyed and 139 "possibly" destroyed. On the negative side, 177 aircraft from the 100th were reported missing in action. About 800 crewmen lost their lives. On the day of the return visit, there was much reminiscing and storytelling. "It was an important part of my life," said George McLeod, 81, of Anacortes, Washington. "I was one of the lucky ones. I survived." On one mission over Germany, his Flying Fortress took three simultaneous flak hits just after releasing its bombs. One of them wounded McLeod, the pilot, and knocked him unconscious, causing him to fall into the controls. The co-pilot, putting the aircraft into a diving turn as was standard after releasing the bombs, had to hold his commander off the controls and fly the airplane at the same time. "He’s flying with his right hand and holding me off the stick with his left," McLeod said. "My co-pilot saved my life." There were many close calls. Glenn Rake, 79, from Sparks, Nevada, remembered flying back to Thorpe Abbotts in a B-17 with two engines shot out, a flat tire, a flat tail tire and 234 holes in the aircraft. "And not a single man wounded. Not one of my men scratched," he said, still a bit amazed at the luck. Not everyone was so lucky. Officers shared quarters, Rake said. The four officers on one crew would share a building with officers from six or seven other crews. "We came home twice and saw all the beds rolled up except for our four," he said, an indication that all of the other crews had been shot down that day. Ken Summers, 81, a former bombardier from St. Louis, wondered aloud about the fate of a big tree at the end of the runway. "Being the bombardier, I was right in the nose," he said. Every flight, he said, he worried about the pilot smacking that tree, but he pulled up just in time. Summer didn’t have to worry about the tree after his eighth mission. His plane was shot down over Leipzig, Germany, on Sept. 12, 1944, and he spent the remainder of the war as a POW. The museum is filled with uniforms, medals, equipment from the B017s and on and on, the paraphernalia of an air combat unit. It is an impressive display run by volunteers and free to the public. But the most popular part of the exhibit for the vets was the area that displayed photographs taken by the men of the 100th during their time at Thorpe Abbotts and provided to the museum. The vets loved to linger in the photo section, looking for and often finding photos of their particular airplanes. More than a few photos show the B-17s in less than pristine condition. It was standard to take pictures of an aircraft that had returned to base despite having taken tremendous hits during the mission. That toughness gave the men great respect for their aircraft. They still insist the B-17 was the best combat aircraft ever to join the U.S. military arsenal. "They could fly," Meiklejohn said. "I’ve seen them come back with holes in them big enough you could ride a horse through." Fitzroy casually mentioned the time his Fortress was flipped upside down by a burst of flak. The bombs tumbled out of their carriage and tore through the roof of the plane. He turned it back over and flew it home. The men of the 100th Bomb Group took pains to point out that they do not think they are heroes. Most interviewed volunteered that opinion. They are, they said, simply survivors. They reserve the term "heroes" for the men of the Bloody 100th who never returned. "I’m here," said Bob Wolff, 80, from Oxhard, California, a pilot who was shot down on this eighth mission. "I’m alive." And everyone readily admitted they were scared. Meiklejohn said he and another vet still argue about who was more scared. "He claims he was and I say I was," Meiklejohn said with a laugh. But then the retired accountant and lawyer turned serious. "The funny thing is, while we were scared to death all the time, nobody ever thought of not doing it."